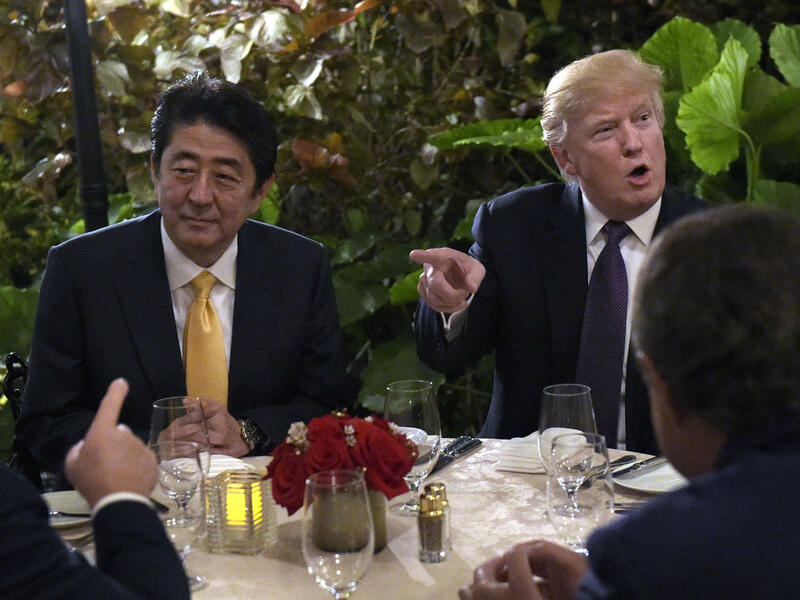 President Trump hosts Japanese Prime Minister Shinzo Abe last month at Mar-a-Lago in Palm Beach, Fla. North Korea tested a missile during Abe's visit and guests at the club overhead the two leaders discussing the incident. The Government Accountability Office has agreed to examine costs and security issues surrounding President Trump's frequent visits to Mar-a-Lago. The president has spent half of his weekends since taking office at the private club he owns in Palm Beach, Fla. The GAO is responding to a request from four Democratic members of Congress — Sens. Elizabeth Warren, D-Mass., Sheldon Whitehouse, D-R.I. and Tom Udall, D-N.M., along with Rep. Elijah Cummings, D-Md. They asked for the review in February, just after Trump hosted Japanese Prime Minister Shinzo Abe at Mar-a-Lago. Guests at the club posted photos on social media of the leaders conferring about a North Korean missile test. Cummings says that raised concerns about security at the private club and who has access to the president. "Anybody can get a membership at the club for $200,000," says Cummings. "We want to know what privileges do they have? And what privileges do they have with regard to bringing their guests?" The GAO, the government's watchdog agency, says it will review what security screening is in place for guests and staff at Mar-a-Lago. Last week, Democrats in the Senate introduced a bill that would call on the president to release logs of visitors to the White House and his private properties, including Mar-a-Lago. That information currently isn't available. The GAO will also examine the security of presidential communications and how Trump and his staff are protecting classified information while at the private club. Democrats are concerned about another issue related to the president's visits — the cost. An earlier GAO report estimated the cost of a weekend trip to Chicago and Palm Beach, Fla., by former President Obama in 2013 at about $3.6 million. That report was requested by Sen. John Barrasso, R-Wyo. Democrats want to know what measures are being taken to make sure the costs the Trump Organization is passing along to taxpayers are "fair and reasonable." Cummings says he's been disappointed Republicans in Congress don't share his concerns about possible ethics violations. "We have now a president," he says, "who it has become normal for him to be able to reap the profits from these hotels while still being president. So, you know it's difficult but we have to keep raising the issue." The GAO has also agreed to review whether the U.S. Treasury has received any payments from hotels owned by Trump. The company, now run by Trump's two eldest sons but still owned by the president, has agreed to turn over to the treasury any profits from payments foreign governments have made to his properties. That's a question with possible constitutional implications. The Constitution's emoluments clause forbids U.S. officials, including the president, from receiving any payments from foreign governments. The Government Office of Accountability is turning its attention to President Trump's visits to Mar a Lago. The GAO will look at how much those visits cost and the security issues they raise. Since becoming president, Trump has spent half his weekends at his private club in Palm Beach. NPR's Greg Allen reports. GREG ALLEN, BYLINE: Back in February, four Democrats, Senators Elizabeth Warren, Sheldon Whitehouse and Tom Udall along with Congressman Elijah Cummings, asked the GAO to conduct the review. It was just after Trump hosted Japanese Prime Minister Shinzo Abe at Mar a Lago and guests at the club posted photos of them on social media conferring over North Korea's missile test. Congressman Cummings says that raised concerns about security at the private club and who has access to the president. ELIJAH CUMMINGS: Anybody can get a membership at the club for $200,000. We want to know, what privileges do they have, and what privileges they have with regard to bringing their guests? ALLEN: The GAO now has responded saying it will review what screening is in place for guests and staff at Mar a Lago. Last week, Democrats in the Senate introduced a bill that would call on the president to release logs of visitors to the White House and his properties, including Mar a Lago, information that's currently not available. The GAO also will examine how secure communications are and how the president and his staff are protecting classified information while at the private club. Along with security, Democrats are also concerned about another issue related to the president's visits, the cost. An earlier GAO report estimated a $3 million price tag per trip. Democrats want to know if the costs the Trump Organization is passing along to taxpayers are fair and reasonable. CUMMINGS: We have now a president who it has become normal for him to be able to reap the profits from these hotels while still being president. So, you know, it's difficult, but we have to keep raising the issue. ALLEN: The GAO also has agreed to review whether the Treasury has received any payments from hotels owned by Trump, a question with possible constitutional implications. The Constitution forbids U.S. officials, including the president, from receiving any payments from foreign governments. The Trump Organization, now run by Trump's two eldest sons, has agreed to turn over to the Treasury any profits from foreign government payments to its properties. (SOUNDBITE OF RUBBLEBUCKET SONG, "MY LIFE") Transcript provided by NPR, Copyright NPR.